The case maker that sent us 3D renders of the Galaxy S8 sent us more info on the upcoming flagship duo - precise measurements of both the S8 and S8 Plus. The large Samsung Galaxy S8 Plus measures 152.38 x 78.51 x 7.94mm. 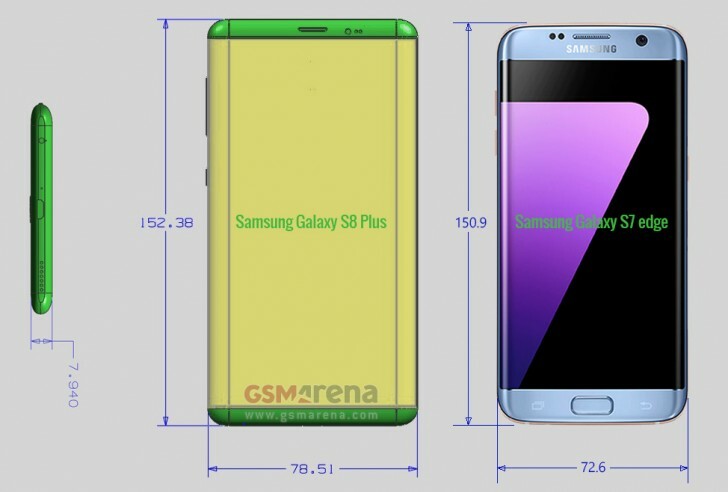 That’s taller and wider than the current S7 edge and for good reason - the screen is surprisingly big. We measured 6.3” apparent size when viewed head on, the true size will be slightly larger (since the sides are curved). The smaller Galaxy S8 is 140.14mm x 72.20 x 7.30mm, slightly shorter and thinner than the current S7, but wider. Actually, we need to be comparing it to the S7 edge as the screen size works out to 5.7” (again, not accounting for the side curves). That means the Galaxy S8 will have a larger screen than the S7 edge while being about the size of the S7! These readings come close to the 5.7”/6.2” dimensions rumored in December. Yes, the phones are wider, but Samsung did everything it could to minimize that - the yellow portion of the S8 schematic is the screen. There’s barely any side bezel to be seen. 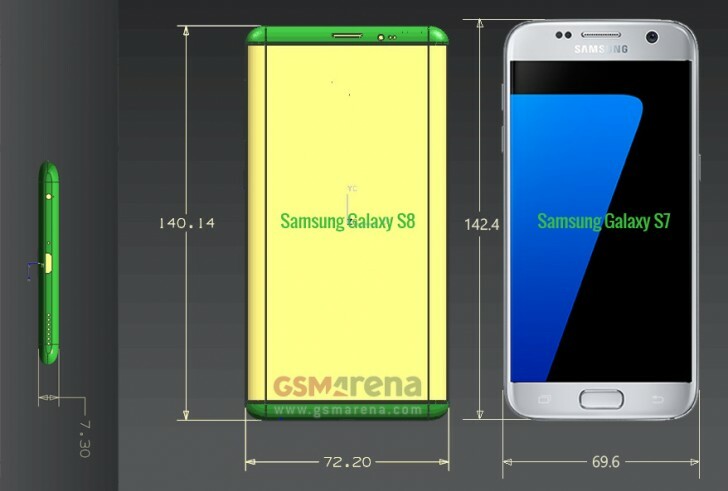 And we’re digging the thin top and bottom bezels. You can just about see the camera stick out the back in the bottom view, it doesn’t look like much. We wonder what the battery capacity is going to be like - there’s not much more internal volume in the Galaxy S8 compared to the S7. We’re not sure about the Power button either (it moved to the left) and this schematic also shows microUSB 2.0 instead of USB-C. We didn’t quite believe it the first time around, but it’s getting harder to deny now - a case maker needs to leave enough room for the plug and the two USB standards are quite different in width.